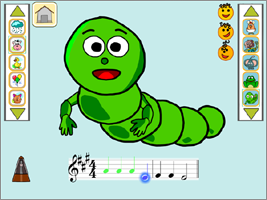 Earworm is a worm that lets toddlers train their ears. It sings a melody and your child sings it back by ear. Earworm has six friends which sing with different voices. Can you sing like an elephant? Or croak like a frog? Kids will have fun singing simple melodies! 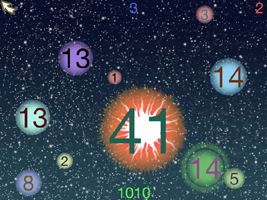 Two Stars is a highly explosive math game that helps you to train speed in addition. You have to combine number stars to make sums of 10. Buddy is hungry! Help him to pick up his bones! Each step to the bone is a special assignment - he will move forward if you manage to tell - how many objects are on the screen. 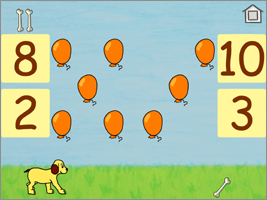 For parents and teachers: our "Hungry Buddy" game develops the ability of players to count the number of items at a glance! This is the next essential step after the child has learned numbers 1 to 10 and can tell them in ascending order. The app lets you test & improve your reflex skills. The aim of the game is simple: right after a signal, tap the "Touch" button as many times as possible. You have only 10 seconds.